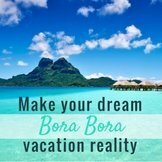 Are you considering a white-sand Christmas in Bora Bora? 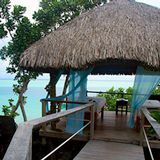 I can't think of a better way to 'live it up' in the holiday season than on the most beautiful island in the world. 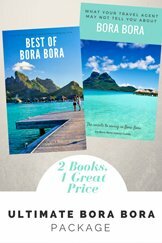 Here's what makes a Bora Bora Christmas so special. 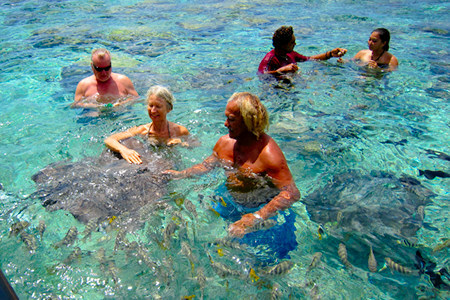 The lagoon's indelible shades of transparent, calm, warm water are legendary. It really is as blue as it's photos! Come and see for yourself. 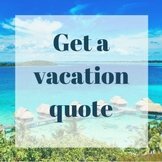 An over water bungalow stay is an unforgettable Christmas present for someone you love (including yourself). 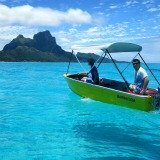 We enjoyed a different style of over water Christmas in Bora Bora. 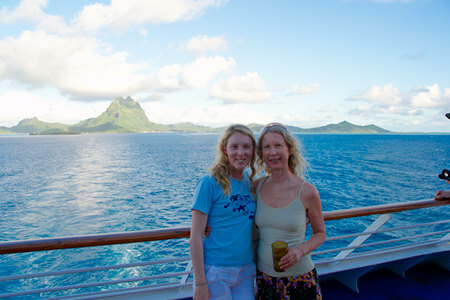 Early on Christmas eve's morning we sailed into the Bora Bora lagoon on a cruise ship. 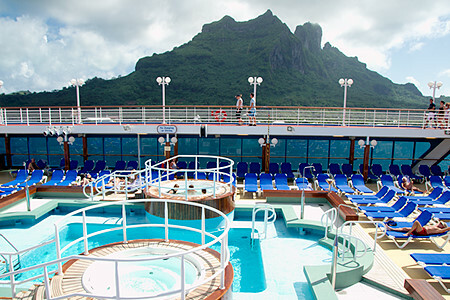 At anchor, near Vaitape, we had a close-up of majestic Mt Otemanu from our balcony. Dining outside at the back of the ship we were surrounded by awesome views across the lagoon to lush volcanic Motu Toopua and Povai bay. We wanted a lazy day so we caught a taxi to famous Matira Beach, to swim and sun on the 2 mile stretch of white sand which has been voted 'best beach in the world'. In the late afternoon we browsed in the interesting little Vaitape shops. They would be closed for Christmas day. Chin's supermarket was bustling with last minute shoppers buying their Christmas supplies. 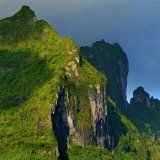 The clanging of bells drew us to the most significant landmark in Vaitape. Islanders were walking solemnly into the church for Christmas eve service. They were dressed in their finest, so we were treated to a colorful parade of traditional fabrics. In some families all members were wearing matching patterns. Red was the predominant color. 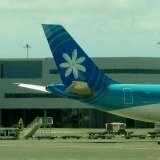 It has a double meaning for Polynesians, as historically it was the color of victory. 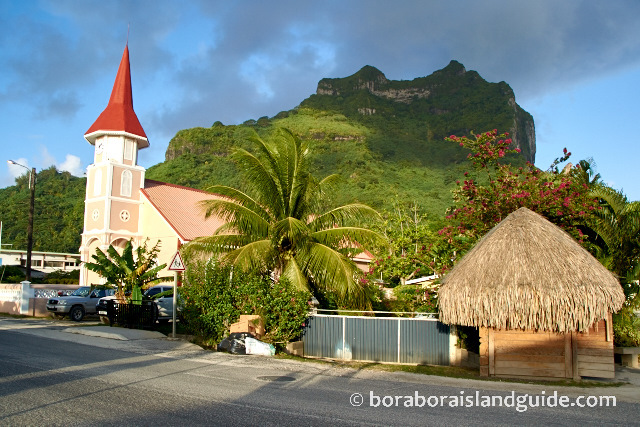 If you have Christmas in Bora Bora (or a Sunday) visit one of the three Bora Bora churches to enjoy some of the finest Capella music that you can hear on the planet. 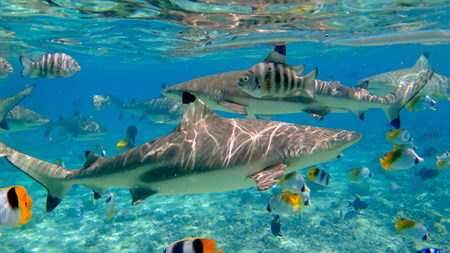 Of course we celebrated Christmas day on and in the beautiful Bora Bora lagoon. 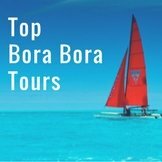 There's no finer way to enjoy Christmas in Bora Bora than boating around it's mesmerizing lagoon to snorkel and have a picnic on a sandy motu. 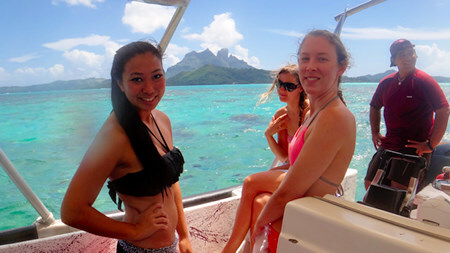 With Bora Bora Island as a backdrop! and visited sacred Motu tapu. 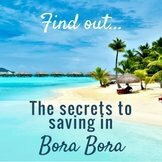 Right after Christmas we visited some of the beautiful Bora Bora resorts. They know how to evoke the spirit of Christmas. 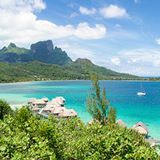 These luxurious hotels make Christmas in Bora Bora lavish and memorable for their guests. 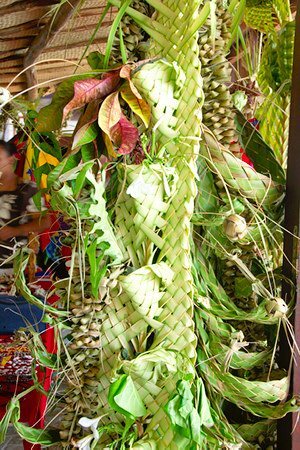 On Christmas eve there's a special dinner with a Polynesian dance show and more feasting (including turkey with chestnut dressing) on Christmas day. Accompanied by good French wines! 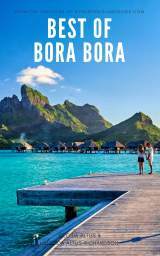 You can have the most exotic Christmas at any of the gorgeous Bora Bora resorts. 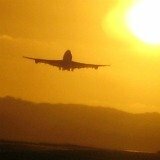 Book ahead as they are busy over Christmas and New Year. 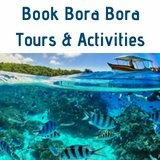 Also do some research and pre-book the Bora Bora excursions you most want to enjoy. 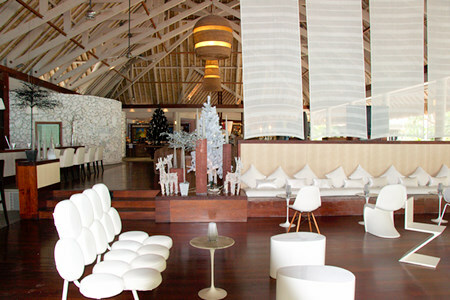 The Bora Bora Sofitel has a big cultural focus so it's Christmas tree is a traditional Polynesian one, created from natural island materials. 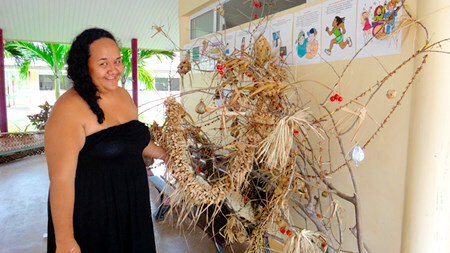 Each year Sofitel Resorts have a Christmas decoration competition. 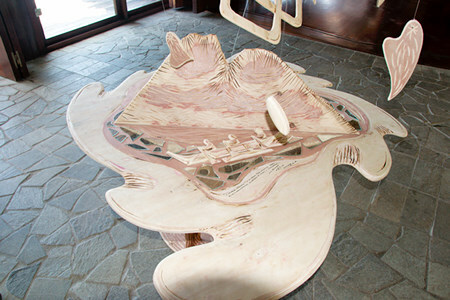 The Bora Bora Sofitel's entry was a multi-level sculpture. At the classy Intercontinental Thalasso the sophisticated Christmas trees and Santa's reindeers matched the elegant all white theme of nearby trendy Le Bubbles Bar. 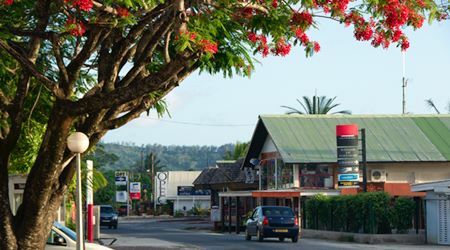 If you walk around Vaitape you can catch a glimpse of village life. There's an expectant air at Christmas. You may notice some excitement at the large open waterfront venue where Christmas parties are held for the employees of each hotel. 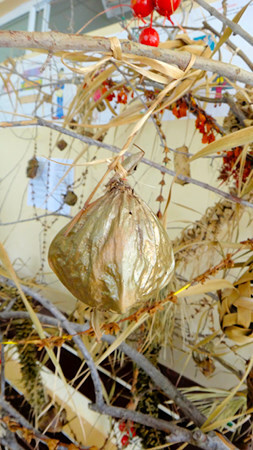 Many islanders spend Christmas day feasting out on private motus with family and friends. 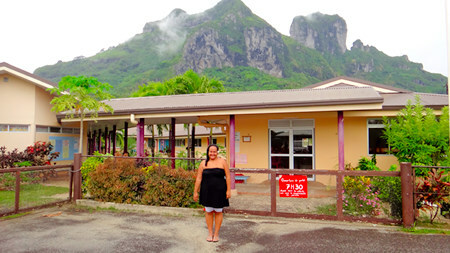 We visited one of the Bora Bora primary schools with Heirani, a friendly teacher we met. Imagine going to school in this location! 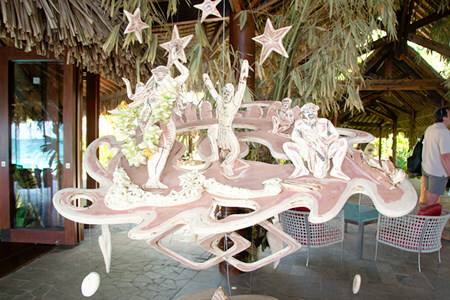 Their Polynesian Christmas tree and decorations were also crafted of natural materials from palm trees. No department store crowds for us! 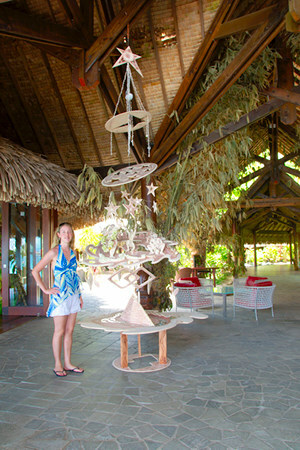 We did our Christmas shopping at Gauguin's pearl farm on remote Rangiroa. We were the only ones visiting and had the fun of removing a few shiny pearls from oyster pockets. 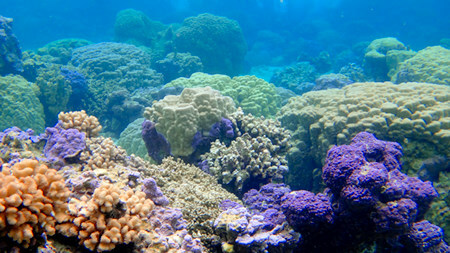 The black pearls of Tahiti are lustrous miracles of nature. I took my time choosing a perfect, large pearl in shimmering colors, and had it made into a simple pendant. Mum searched through a tray of small 'A' grade pearls to find matching ones for earrings. On Christmas morning Santa had left us each a tiny present with something precious inside. 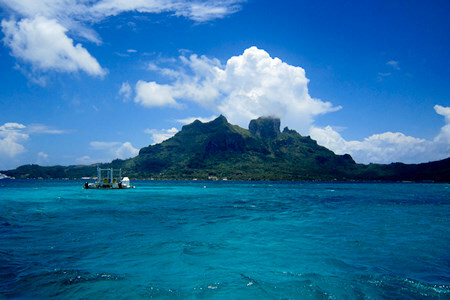 Every time we wear our beautiful pearls we think of Christmas in Bora Bora on the turquoise lagoon. 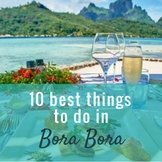 If you're having Christmas in Bora Bora wait until you arrive to buy presents. Black pearls are the ideal gift. 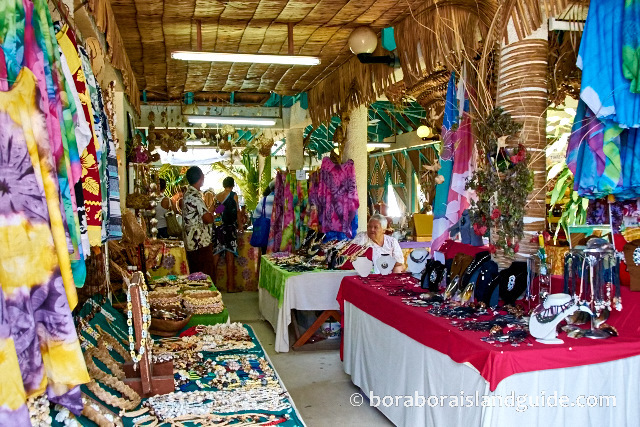 Bora Bora has some great black pearl shops. If you want an inexpensive piece of black pearl jewelry you can find that at the Art and Crafts Center at Vaitape wharf. Plus a wide variety of creative and interesting presents. 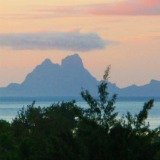 How Was The Bora Bora Christmas Weather? Over the Christmas days the weather was fine, warm and humid. Not too hot. Around this time there would be a passing shower some afternoons. There'd be just enough rain to cool things down, and then it would be fine again. The refreshing rain kept the tropical foliage lush and fragrant. 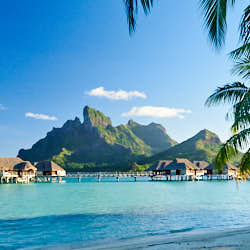 Warm summer weather makes Christmas in Bora Bora extra enticing for those in the northern hemisphere. 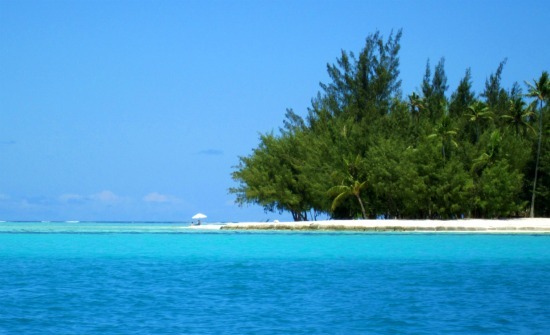 Here's more stories about our Christmas in Tahiti. 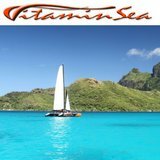 You can also read what it's like to sail to Bora Bora on a Christmas cruise through 5 pristine Polynesian islands.